Metroidvania Month has come to a close, and this week’s game is a sequel! Guacamelee! 2, the sequel to 2013’s Guacamelee!, is a new adventure from Canadian developer Drinkbox Studios, and it’s bigger and crazier than its beloved predecessor. 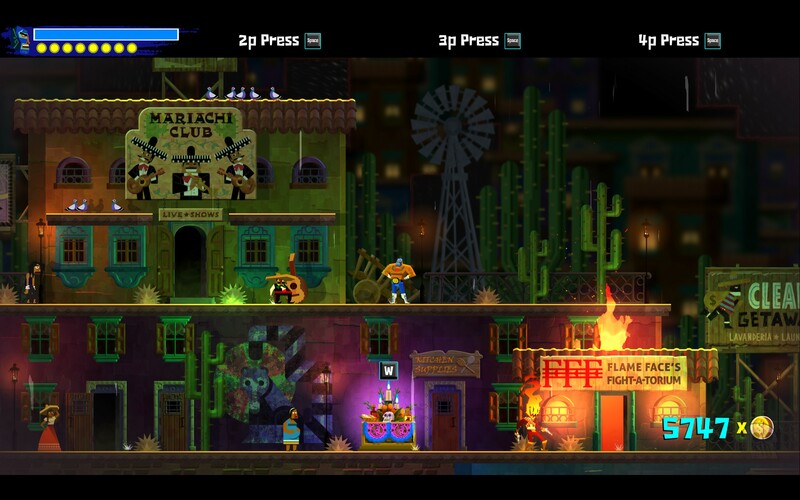 Building off of the unique high-flying beat-em-up combat in the first game, Guacamelee! 2 sets out to be everything the first one is and more. But ultimately, Guacamelee! 2 buckles under its own over-the-top design choices, delivering on the luchador action but wrapping it in a dull, linear Metroidvania full of unnecessary mechanics and annoying attempts at humor. Guacamelee! 2 really feels like it’s built out of the bones of its predecessor, and that’s one of the best things about it. The combat and movement feel almost exactly like the first game, maintaining the same crisp and responsive feel. The lucha libre combat stylization is both fluid and satisfyingly weighty, full of organic combos and finishers and some animation cancelling mechanics that unlock even greater combo potential. It’s worth reiterating how solid the basic combat is because it’s what drives the game in its earlier spaces, and it emphasizes the fact that the game works much better before it piles on a ton of other mechanics. But beyond the first couple of hours, it doesn’t really play to its own strengths. See, Guacamelee! 2 really wants to have its cake and eat it too. Early on it begins introducing new ability after new ability at an absurd rate. Typically, Metroidvanias build a sort of anticipation-release cycle around new abilities; you’ll spend a decent time exploring, following a path, looking for ways to progress. Finally discovering that upgrade is a triumphant moment, an epiphany of sorts. 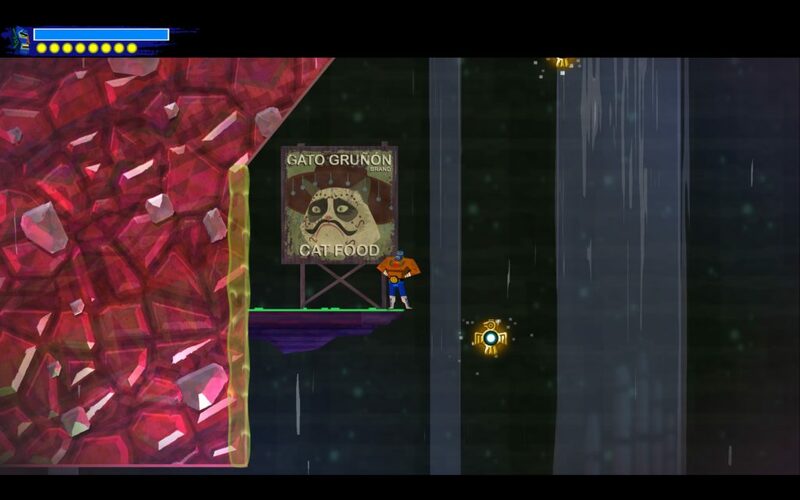 You think, “ah, so that’s how I’ll get past that thing from earlier.” But in Guacamelee! 2, I was practically tripping over upgrades. I would hit a roadblock that indicated very obviously what ability I was about to find, and then I’d find it moments later. Six or seven hours into the game, I had so many different actions available to me that I was regularly forgetting which button did what. 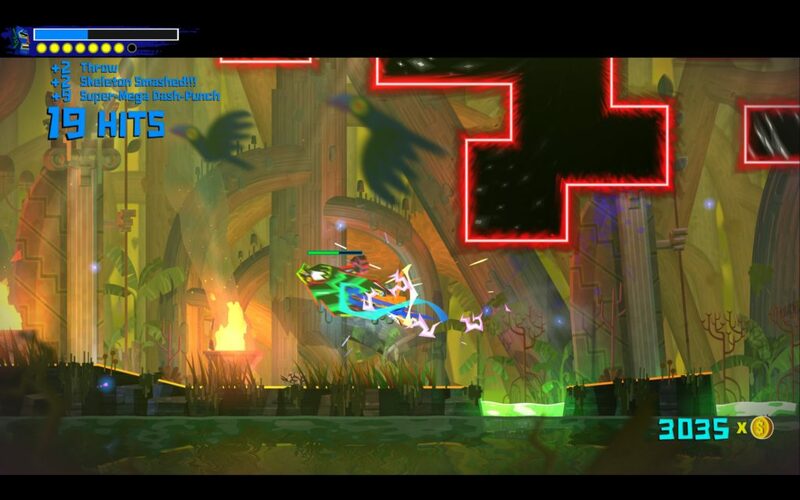 Where other Metroidvanias introduce new abilities with depth and versatility, Guacamelee! 2 is an endless sequence of “well now you can do this specific movement.” I got the sense that the onslaught of new abilities was itself a running joke, but it was to the serious detriment of overall play. While the game’s upgrade mechanics are breakneck, the exploration is extremely lacking. The world consists of a collection of mostly linear paths, with no real spaces to explore other than small challenge rooms that branch off the main path. Even more frustrating are the occasional detours to areas that exist solely to make prolonged jokes or references to other games. The only driving force through the world is a map marker with the next objective, which is usually the only place you can actually reach anyway. The game operates under the pretense of having a Metroidvania world structure, but it feels much more like a linear platformer with a few hidden treasures to backtrack for later on. And it isn’t just the mechanics that want to have it both ways. The game follows former luchador Juan Aguacate (yep, that’s “Avocado” in Spanish) as he travels between alternate universes to save the entire “Mexiverse” from certain destruction. The aesthetics of the game draw from Aztec temples and Mexican art and music. But the game is also full of cheeky humor, memes, and pop culture references that undermine any degree of respect it has for these cultural elements. Much of the “lol random” style of humor falls into the cringey trope of arbitrarily invoking names of Mexican foods. After all, English speakers recognize words like “tostada” and “guacamole”, so let’s center the plot around them! NPC dialogue often consists of tone-deaf jokes (references to things like “fake news” and global warming denial) or just stereotypical topics (piñatas, nachos, cacti, etc.). Aspects of Mexican culture are transplanted into the world for their aesthetic alone. Does it really make sense for Dia de los Muertos altars to be scattered throughout the wilderness? Or are they only used as checkpoint markers because they’re pretty and colorful? Jokes and references don’t seem to be from actual Mexican internet and pop culture. Instead, they’re references for English speakers… but with lucha outfits or sombreros. Oh look, it’s Grumpy Cat with a mustache and sombrero! Is this… funny…? Honestly, the harmful cultural appropriation in this game is it’s own entire topic of discussion. But it also underscores the game’s broader desire to be both serious about its design and totally irreverent and silly. Guacamelee! 2 doesn’t set out to tell a story that’s actually about Mexican mythology. It only wants to use those aesthetics as a stylish vessel for its own zany narrative and sense of humor. And in the end, the game flounders mechanically as well. While the game’s opening moments are relatively strong, the deluge of new abilities starts to burden it pretty quickly. Platforming sections are impeded by the need to remember which sequence of buttons trigger which sequence of abilities. The skill tree offers a bunch of upgrades, but the majority feel more like a resource sink than meaningful improvements. Not to mention, it’s pretty trivial to obtain all of the skills well before the game ends. The plot’s trajectory through the world is mostly linear, and it never rewards backtracking with anything remarkable. Humor occasionally lands, but many of the jokes are overwrought, long overstaying their welcome. All the while, the numerous references to other games and pop culture quickly become annoying. Simply put, this game is a bigger, prettier and more over-the-top version of its predecessor; but where its predecessor was novel, concise and at least a little charming (it helps that it was released in a different political climate), Guacamelee! 2 is overstuffed with exaggerated, tasteless humor and needless mechanical complexity. It retains its most unique and delightful aspects — cooperative play and fun lucha-inspired combat — but it wraps them in so much additional junk that it falls apart at the seams. Good Metroidvanias tend to be powerhouses of precise and thoughtful game design, and Guacamelee! 2 is just too all-over-the-place to manage that attention to detail. Appropriation aside, it’s not a bad game, but you’ll probably put it down before you finish it.